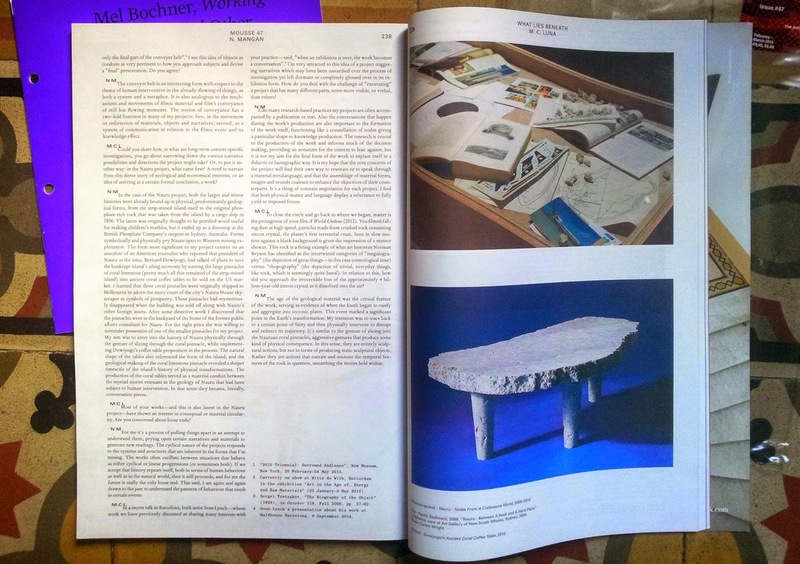 The February–March 2015 issue of Mousse Magazine (#47) includes the interview 'What Lies Beneath' between Melbourne-based artist Nicholas Mangan (1979, Geelong) and Mariana Cánepa Luna of Latitudes. 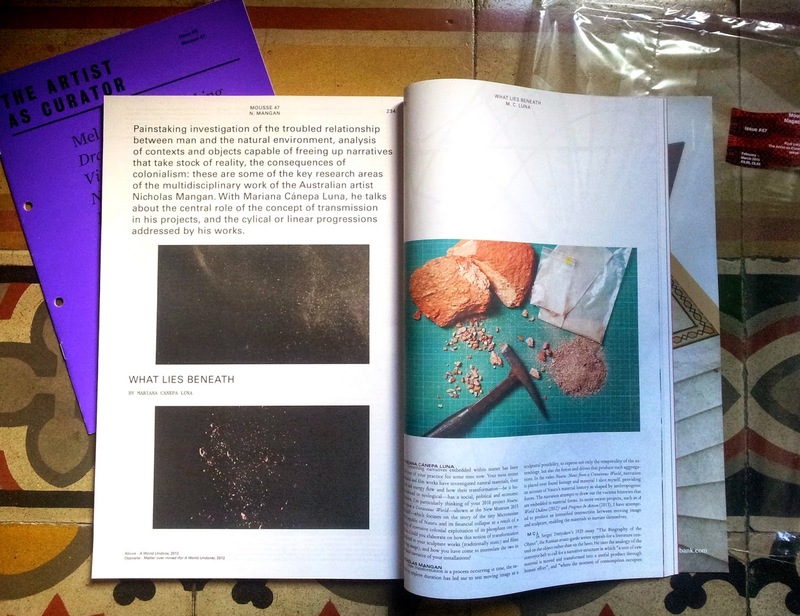 Layout of the interview in English and Italian on the pages of Mousse Magazine. 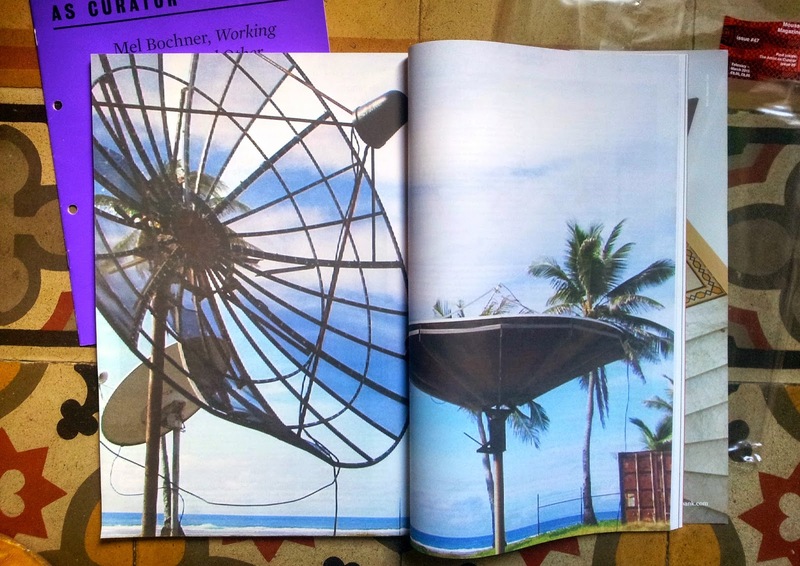 The interview centers primarily on discussing the artists' methodologies through two of Mangan's recent works: 'A World Undone' – currently on view as part of Witte de With's show 'Art in The Age of...Energy' (23 January–3 May 2015) – and his film and sculptural work 'Nauru - Notes From A Cretaceous World' which will soon be featured as part of the New Museum's 2015 Triennial: Surround Audience curated by Lauren Cornell (Curator, 2015 Triennial, Digital Projects and Museum as Hub) and artist Ryan Trecartin. 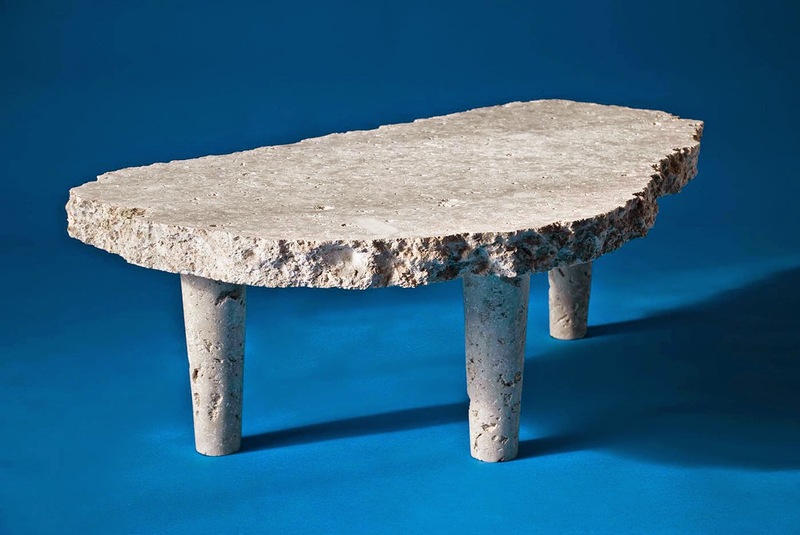 'Dowiyogo’s Ancient Coral Coffee Table', 2010. Courtesy of the artist, Sutton gallery Melbourne and Hopkinson Mossman Auckland. 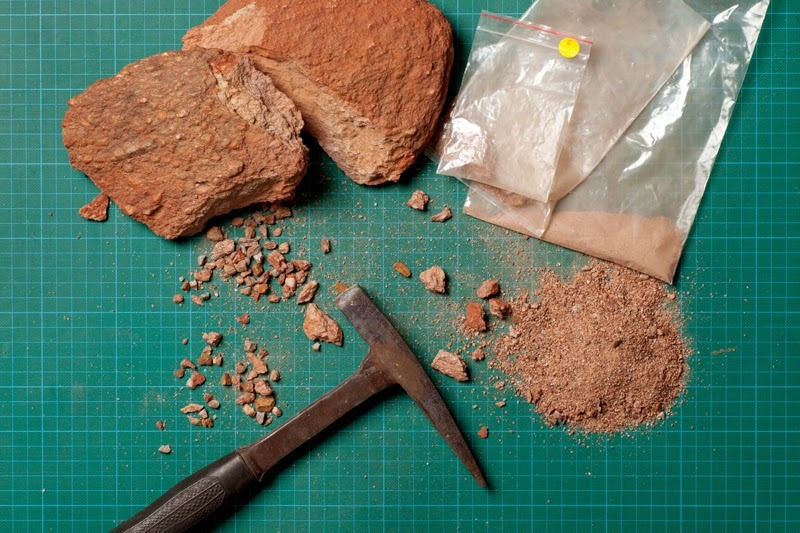 MCL: Unearthing narratives embedded within matter has been at the very core of your practice for some time now. Your most recent sculptural and film works have inquired into natural materials, their transit and energy flow and how their transformation – be it human-induced or ecological – have a social, political and an economic dimension. I'm particularly thinking of your 2010 project 'Nauru: Notes from a Cretaceous World' – featured at the New Museum 2015 Triennial– which focuses on the story of the tiny Micronesian island Republic of Nauru and its financial collapse as a consequence of a century of corrosive colonial exploitation of its phosphate ore resources. Could you elaborate on how this notion of transformation is explored in your sculpture works (traditionally static) and films (moving image) and how you have come to interrelate the two in the spatial narrative of your installations? NM: As transformation is a process occurring in time, the necessity to explore duration has led me to test moving image as a sculptural possibility, to express not only the temporality of the assemblage, but also the forces and drives that produce such aggregations. In the video ‘Nauru: Notes from a Cretaceous World', narration sits over found footage and material that I shot myself, providing an account of Nauru’s material history as shaped by anthropogenic forces. The narration attempts to draw out the various histories that are embedded in material forms. In more recent projects, such as ‘A World Undone’ (2012)and ‘Progress In Action’ (2013), I have attempted to produce an intensified intersection between moving image and sculpture, enabling the materials to narrate themselves. 'Nauru - Between A Rock and A Hard Place' installation view at Art Gallery Of New South whales 2009. Courtesy of the artist, Sutton gallery in Melbourne and Hopkinson Mossman in Auckland. Photo: Carley Wright. 'Mined over matter', 2012. C-print on cotton paper, 69 x 103cm. Courtesy of the artist and LABOR Mexico. 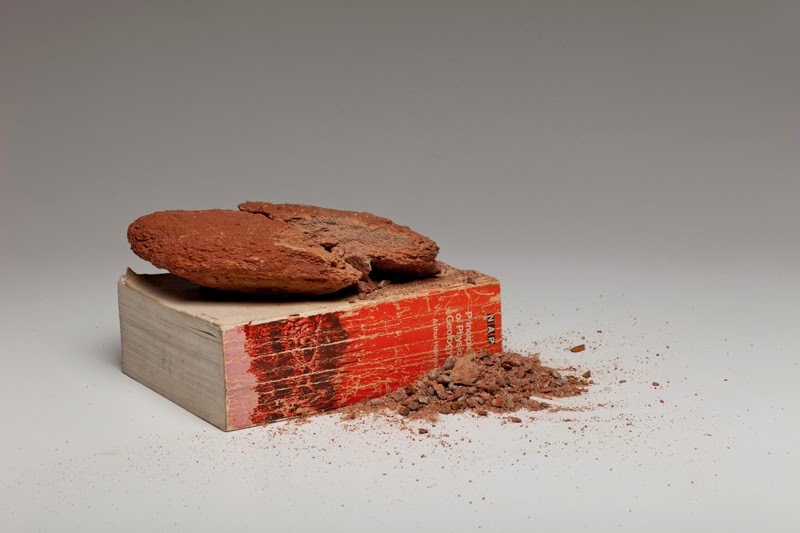 'Matter over mined (for A World Undone)', 2012. C-print on cotton paper 69 x 103cm. Courtesy of the artist and LABOR, Mexico. 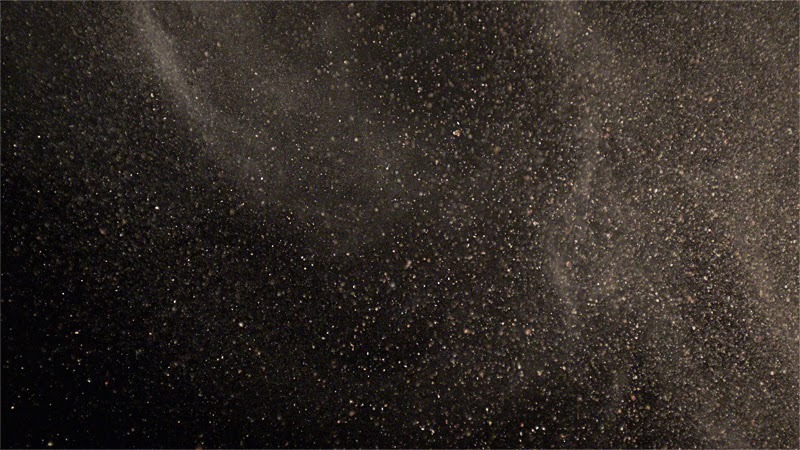 'A World Undone', 2012 (video Stills). HD colour, silent, 12min continuous loop. Mangan works with LABOR (México DF), Sutton Gallery (Melbourne) and Hopkinson Mossman (Auckland). Visiting Curator Program, Gertrude Contemporary, Melbourne, 12 May–7 June 2014 (28 April 2014). 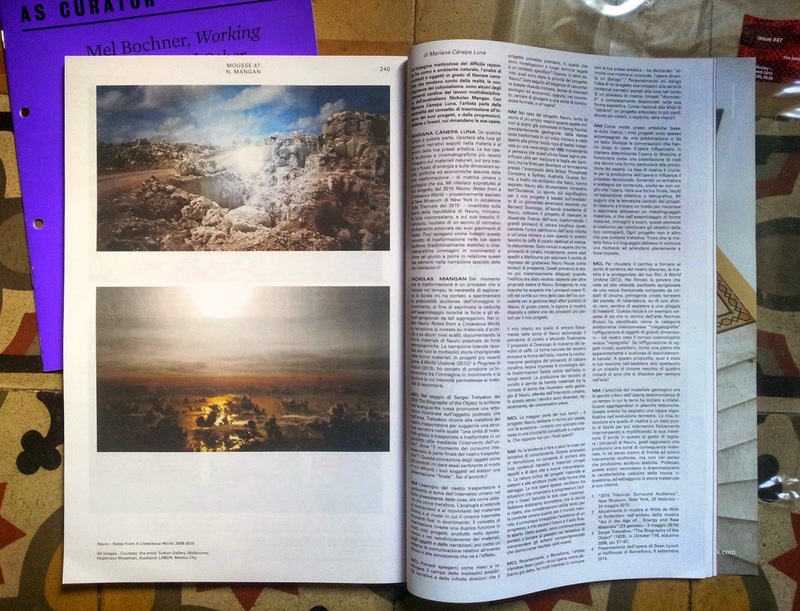 Interview 'Free Forms' with Lauren Cornell part of Latitudes' 2012–13 long-term research #OpenCurating, released on April 2013 via Issuu.